For many who attended last year’s conference, this event was the highlight. Twelve students from a variety of Schools and Departments presented their doctoral research in three minutes or less, using just one PowerPoint slide. If you think you can summarize your PhD into an engaging and entertaining three minute talk, then why not enter this year’s competition? A juding panel will select an overall winner, whilst conference delegates will also be able to vote for the ‘People’s Choice’ winner. Full details and an application form can be found here: http://www.reading.ac.uk/gs-threeminutethesis.aspx If you need some inspiration, why not watch last year’s winning presentation by Jessica Sage (English Literature) at the above web link. All the above competitions are open to doctoral researchers from all University of Reading faculties and year groups, including those undertaking professional doctorates. First Prize winners of the conference competitions each receive £100. Doctoral Researchers who would like to attend the conference can request a place via the RISIS web portal. Please note that attending the conference counts towards your RRDP training requirement. The conference also features the four Faculty finalists of the PhD Researcher of the Year Award. Students are nominated for this competition by their School; they cannot directly enter. In 2013 PhD Researcher of the Year was awarded to Katherine Livingstone, from the School of Agriculture, Policy & Development. 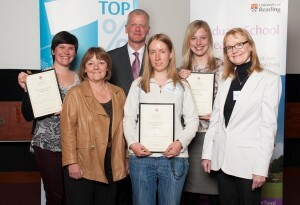 Last year’s Conference competition winners (L-R) Jessica Sage, Jennifer Wickens and Katherine Livingstone with the VC, Sir David Bell; Pro-VC, Professor Christine Williams and Dean for PGR Studies, Professor Dianne Berry.